Dear Qoovee User, first of all, we want to congratulate you for being in the registration phase on qoovee.com! You can explore the opportunities and benefits we provide for our users. The first thing we need to do is to Sign -Up. Oops! Whould you like to remember what is qoovee.com? Open the qoovee.com website on your browser. To add your company click to the “Add Company” button. Next, You should select a Subscription Plan. There are 3 types of Plans (Free, Business and Premium). You can find a detailed information about Plans here as well. 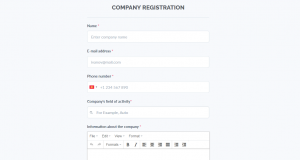 E-mail Address – Email address of your company. Orders and emails of buyers will be sent to this email address. Congratulations! You have your company added to the GLOBAL qoovee.com wholesale platfrom.